How Can Bookmarks Help With Your Marketing? Custom-printed bookmarks serve as miniature print ads that you can use to promote your business in a convenient and affordable way. Whether your customers like thumbing through the pages of their favorite classic novel or the latest New York Times Bestseller, these foil bookmarks are guaranteed to make a statement. What Are My Foil Bookmark Printing Options? 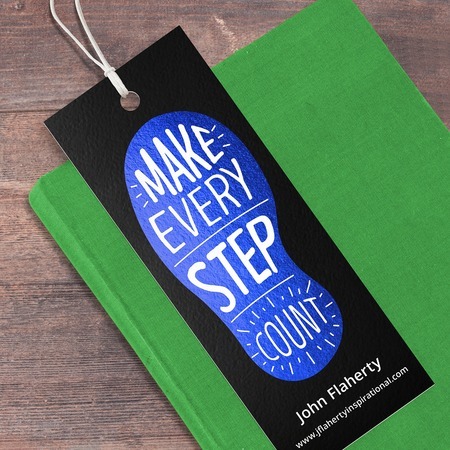 Our personalized bookmarks are printed on a thick and durable 16 pt. cardstock with a 1/8" inch hole drill. Foil stamping allows your artwork to stand out. Choose from the beautiful shades of gold, copper, silver, black, red, and blue. You may choose to add spot UV coating to give your artwork an extra sheen. How Can I Make My Foil Bookmarks Stand Out? Think about your audience. Who are they and where can you find them? Plan your budget. Set a budget to know how many pieces you can print and distribute. Keep your artwork simple. Leave some space for your most important information. Be clear with your message. A direct message is sometimes more effective than a clever one.